This is a good post. I’m a self-help writer myself, and one of the things I’m always telling people is that they need to take action and be realistic. You can’t build a better life on just happy thoughts and wishful thinking. You also made a good point about helping others. I experienced some of my greatest growth through helping others, and it actually became my passion. You make a couple of great points. 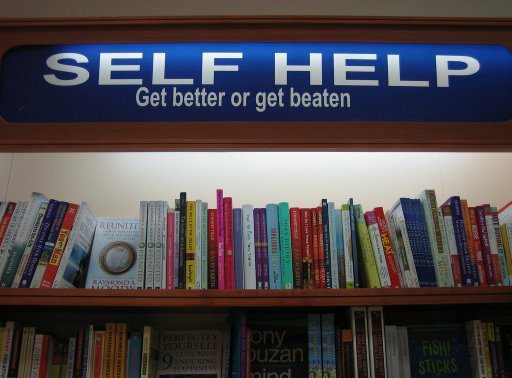 I am a big fan of improvement through self-help books. But if you do not go out there and put the stuff to use, you are really just wasting your time. The patience problem is something that I am seeing more and more of. Either that or I am turning into a crotchety old guy as I approach 40. More and more people are having issues with delayed gratification. With all the instant access to, well everything, some people want results and they want them NOW! When most really good things take time and effort for success. @Ericson Ay Mires: Thanks for dropping by Eric. Yeah I think as people, we all need the experience and interaction with other people to actually see a change from within. The sad thing is most of us today always look for short cuts, which never happens. @Myrko Thum: Thank YOU for having me Myrko! Thanks so much. It’s this unique approach that I do what I do. Ericson, I think if you consume really good information, maybe a good book, just reading and internalizing the information can already transform your mindset. Then your action would adjust the one way or the other. But still, actually implementing practical information is of course better. I use to spend hours looking at self-help sites, learning and absorbing everything that I could. But nothing ever really made my life better. It’s not that the advice was useless, but I spent more time reading than I did applying. I wasn’t going out and testing all lessons I was reading about. Because of it, the advice became useless as it wasn’t being put to good use. Now I only read as much as I’m willing to apply. It’s made an immense change in the results I receive out of my life. Every lesson never goes wasted, and I feel much more purposeful than I use to feel. Hey Alden, thanks for your honest and also entertaining guest-post. I which you all the best with your unique approach to personal development. Hey folks, get his free report to see what Alden can really offer you.